French Government authorities, in- volves the 52,500-cubic-meter LPG carrier Dovertown. France, is scheduled for delivery next month. Universal Gas and Oil expects to recognize cash receipts of approxi- mately $16 million, of which ap- proximately $10 million will repre- sent profit. UGO anticipates utiliz- ing the proceeds from this sale to pursue other projects currently un- der consideration. Universal Gas has two other ves- sels under construction which are 35,000-cubic-meter liquefied natural gas carriers, and are currently un- dergoing modifications at the ship- yard in order to qualify for regis- tration under the U.S. flag. Both of these vessels are scheduled for de- livery by the end of 1974. Fruit Carriers presently owns ap- proximately 76 percent of Univer- sal Gas and Oil. Universal Gas and Oil will en- gage primarily in the transporta- tion of liquefied gases. In addition, the cqmpany owns various oil, gas and hard mineral exploration rights. A.C. Hoyle Company, Iron Moun- tain, Mich., has announced the ap- pointment of Donald W. Sailo as vice president-chief engineer of de- sign and products. Mr. Sailo has had many years of experience in the marine equipment design field. The A.C. Hoyle Company mar- kets a complete line of marine deck equipment, mooring winches, cap- stans, cranes, fairleads, and other marine auxiliaries. Mr. Sailo will headquarter in the home offices located at 103 East "A" Street, Iron Mountain, Mich. 49801. Electronics, Inc. of Kodiak, Alaska. Kodiak, Seattle and Portland offices." A Division of Beatrice Foods Co. ^^^mmmmm^^^^^^^^^SS^BBSS^^^^^SSSaii^KKtKm We don't just supply paint. 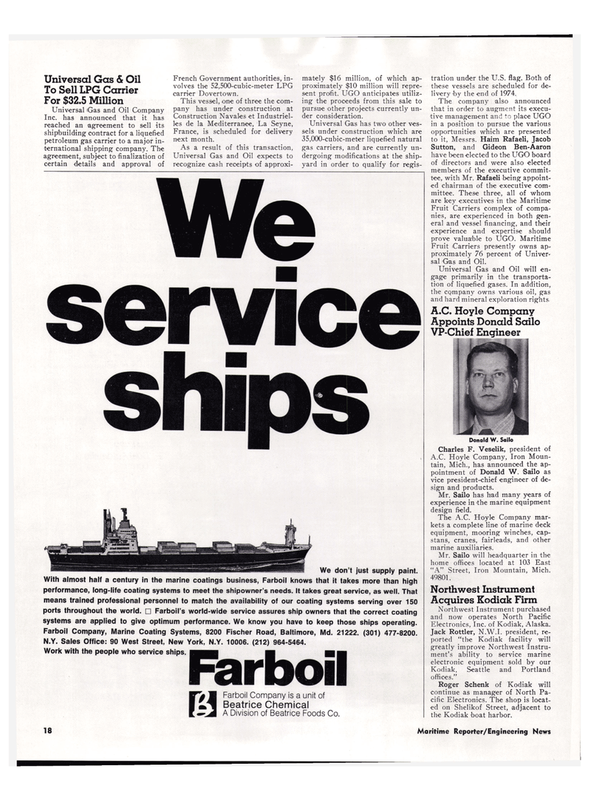 With almost half a century in the marine coatings business, Farboil knows that it takes more than high performance, long-life coating systems to meet the shipowner's needs. It takes great service, as well. That means trained professional personnel to match the availability of our coating systems serving over 150 ports throughout the world. • Farboil's world-wide service assures ship owners that the correct coating systems are applied to give optimum performance. We know you have to keep those ships operating. Farboil Company, Marine Coating Systems, 8200 Fischer Road, Baltimore, Md. 21222. (301) 477-8200. N.Y. Sales Office: 90 West Street, New York, N.Y. 10006. (212) 964-5464.